Akaso is known for their action cameras, which have become increasingly popular over the past decade. The EK7000 is one of their most advanced models and its main selling point is the 4K shooting capability. It’s a great asset for individuals who participate in extreme sports and want to document their adventures. The camera has been on the market for less than two years and has amassed thousands of reviews. It is also ranked as a #1 Best Seller on Amazon in the Cameras category. If you are not sure this is a good purchase for you, find out more in this Akaso EK7000 action camera review. As we kick off this Akaso EK7000 action camera review, let’s take a quick look at the technical specifications and features that the camera has to offer. With the Akaso EK7000 action camera, you have the option of shooting in 4K at 25 fps, 1080p at 30 fps, and 1080p at 60 fps. The camera has a 2″ LCD screen for viewing videos and a super wide angle lens that makes it easy to capture videos in all kinds of weather. We love the fact that you can use this camera 100 feet underwater without worrying about damage, thanks to the included waterproof casing. The WiFi capability is a nice bonus for individuals who love showing off their work to family and friends. You can also take advantage of this feature when editing or viewing videos on a phone or laptop. The Akaso EK7000 action camera also comes with a USB cable, a lens cloth, a protective backdoor, a bike stand, helmet mounts, and clips. The next sections of this Akaso EK7000 action camera review takes an in-depth look at its features. The whole point of owning a camera is taking quality shots and shooting great videos. That said, it only makes sense that our Akaso EK7000 action camera review touches on the camera’s image quality and performance. The Akaso EK7000 action camera is capable of shooting professional 2.7K footage at 30 fps and 4K at 25 fps. It captures 12MP still photos at up to 30 fps. The 170-degree wide angle lens is a welcome addition that creates a great immersive effect. For a camera in its price range, the auto focus is spot on and the colors are incredible. You can capture footage and still photos in any of the available modes including single photo, burst photo and time lapse. The sensor can capture 12MP still photos at 30 frames per second. Contrary to what you would expect from a 4K camera, the Akaso EK7000 action camera recordings don’t look very good when shot in slow motion and at higher resolutions. Videos shot at standard frame rate are not too shaky and look smooth. If there is one area where the Akaso EK7000 action camera excels, it is design and controls. All of the components are housed in a smooth silver build, which is then encased in a transparent cover. The Akaso EK7000 action camera is quite compact compared to other models and the sensor protrudes from the body, but this isn’t too much of a problem. It ships with a 2.4G RF remote control that allows you to record and take still photos while on the move. You can also use it to frame photos without using your hands. WiFi capability makes it easy to pair the camera with your iOS or Android device. However, you will have to download the Akaso app to take advantage of this feature. This camera is powered by two rechargeable 1050mAh batteries that allow for up to 90 minutes of recording time. It also ships with a waterproof casing that is IP68 certified, allowing you to use it at a maximum depth of 100 feet underwater without worrying about damage. Note: If these aspects are important to you but this camera isn’t exactly what you’re looking for, we also recommend reading our review of the Victure Action Camera. There are many things to love about the Akaso EK7000 action camera some of which are mentioned below. Has a 170-degree wide angle lens. Picture quality is crisp and sharp. Spare batteries are easily available. Waterproof casing works for a maximum of eight hours. Great color production and exposure. Has the ability to shoot time lapse videos. Doesn’t have any internal memory. Low resolution still photos could be better. If there is one thing that this Akaso EK7000 action camera review has revealed, it’s that this is one of the best sport action cameras on the market. For one, you can shoot 4K footage at 25fps. You can also opt for 1080p recording at 60 frames per second if you want the smoothest video quality. We love the waterproof casing as it allows you capture still photos and videos almost 100 feet underwater. What’s even better is that the inbuilt WiFi allows you to remotely control the camera via iOS or Android. The Akaso EK7000 is a great investment – in fact, its the best action camera in its price range. It has great video quality and behaves extremely well in all weather and visibility conditions. However, if you’re serious about your action videography and only want the best, we recommend also taking a look at the GoPro HERO6. It’s a bit more expensive, but it makes up for the extra investment with great still image quality and functionality. For the adrenaline junkie who loves documenting their adventures, the Akaso EK7000 action camera would make a great investment. It works great for documenting skydiving, skiing, surfing, bike rides, runs and hikes. The camera boasts superior recording and excellent performance, something that extreme sport enthusiast look for. Users can mount it on the helmet, surf board, chest or bike and utilize their phones or remote control to frame shots. 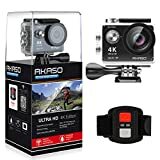 This action camera comes with many useful accessories including USB cable, remote control, bike stand, helmet mounts, batteries and more for an exceptional shooting experience.